Blaise Matuidi has pleaded with the French public to have patience with Ousmane Dembele as he continues to work towards his huge potential. 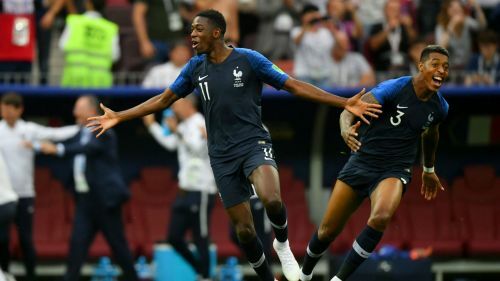 The France winger joined Barcelona in a €105million deal in 2017, but an injury-hit first campaign in LaLiga kept the 21-year-old on the fringes of Les Bleus' squad as they won a second World Cup in Russia. Dembele made his first international start since the tournament as France battled back to draw 2-2 with Iceland on Thursday, yet colleague Matuidi is not willing to draw grand conclusions from his performance. "I don't want to say that [Dembele] faces big difficulties - he does good things and he does bad things, like everyone else," Matuidi said. "He is young and we expect a lot from him because he has a lot of talent. But we are pleased with his performances. He can improve but so can everyone else. The most experienced players are there to give him advice. "He is at a club that will allow him to improve. He has taken it to the next level if we compare to last year. He started very well at Barcelona at a club where there is a lot of competition. The future is ahead of him. "You shouldn't be too hard with him. He can still do great things. He's going to help us, that's for sure." Matuidi also believes France are finding each of their opponents have an increased motivation to defeat the reigning world champions. "I think you already saw it in our first two matches against Germany and Netherlands," he said. "We are world champions - it's great to have this status but the matches are no longer the same. The opponents look at us differently. We have to raise our level."